Pulsars are fast rotating neutron stars that result from the supernova explosion of a massive star. This fast rotation induces a strong magnetic field, of 108 to 1015 times the magnetic field of the Earth, which in turn induces an electric field strong enough to overcome the neutron star's gravity and remove particles from the neutron star surface, accelerating them along the magnetic field lines. This produces a cascade of particles, electrons and positrons, that travel along the magnetic field lines, and are further accelerated at the wind termination shock. This accelerated material can interact with ambient photons and transmit their energy to the photon field, boosting the photons up to gamma-ray energies. Due to these interactions, large extended regions around pulsars can be observed in gamma rays, called pulsar wind nebulae. Of the many pulsar wind nebulae seen by H.E.S.S., HESS J1825-137 is both the brightest and largest . With a received flux at Earth of more than half the strength of the Crab nebula, yet located at twice the distance, this nebula is one of the most powerful gamma-ray sources seen in our galaxy. HESS J1825-137 was the first source found by H.E.S.S. to exhibit clear energy dependent morphology at TeV energies, revealing the particle propagation in the nebula. Over the energy range of H.E.S.S. the source shape changes considerably, reducing significantly in size towards higher energies and with the peak of the emission shifting towards the position of the pulsar PSR B1823-13, giving considerable credence to its identity as the progenitor of the nebula. Fig. 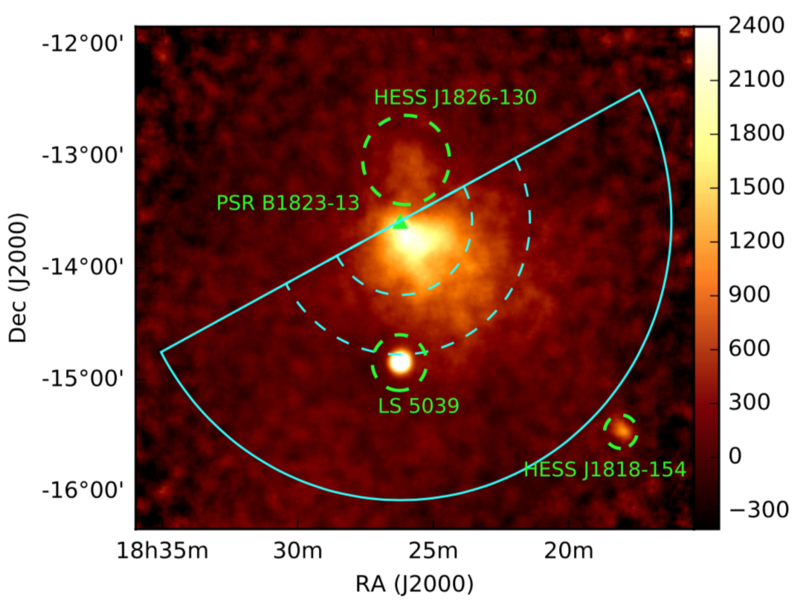 1: Excess counts maps of the HESS J1825-137 region in four energy bands. The size of the nebula dramatically reduces towards the highest energies. 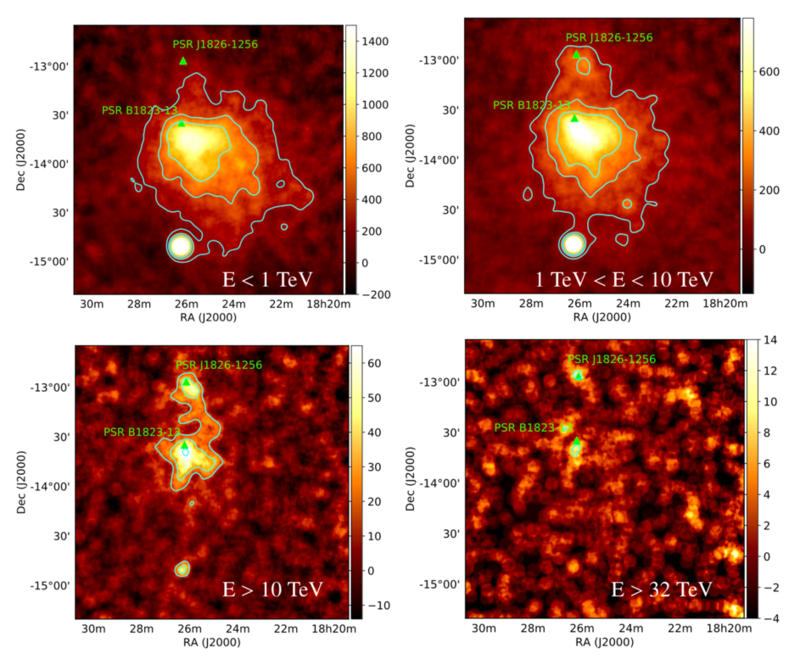 There remains significant emission from the nebula at energies above 32 TeV, something rarely seen. Two other sources are present in the field of view, a point-like binary system LS 5039 to the South and a second extended source HESS J1826-130 to the North [2,3]. This reduction of the nebula size with increasing energy is reminiscent of the expected behaviour for particle transport and cooling over the nebula lifetime. Several modelling studies have already been dedicated to this source, finding that multi-zone modelling approaches are needed to describe the overall behaviour . To characterise the extent of the nebula, we fit the radial profile of the emission, masking over other sources in the region, and measure the distance at which the flux drops to a fixed fraction of the maximum as an extent measure. The orientation of the radial profile was determined by the peak emission around the azimuthal spread. Fig. 2: Left: Excess counts map of the region over the full energy range, showing the region from which emission is extracted for the radial profile. Centred on the pulsar and orientated along the major axis of the emission. Masks were applied over other sources in the region. Right: Fitted radial profile. Red lines correspond to flux dropping to 50% and 1/e (~37%) of the peak value, respectively. Figure taken from . By analysing the nebula in many energy bands, it is possible to measure this characteristic extent as a function of energy. The behaviour can be used to constrain the particle transport occurring within the nebula. Limits to the fit are imposed by the expected timescale for cooling losses to occur (at lower energies, the parent particles are effectively uncooled such that the source is expected to grow with energy) and for the transition into the Klein-Nishina regime towards higher energies, above which the source size is expected to reduce dramatically. There are two possible scenarios for dominant particle transport mechanisms within the nebula: diffusion and advection. Diffusion consists of a random walk of particles due to their deflection caused by turbulences of the magnetic field, whereas advection refers to a flow inducing the particle movement. In both cases, simple relations between the nebula radius and gamma-ray energy may be derived. We find that the changing nebula extent with energy, as measured along the main axis of the nebula, is more compatible with the case of advection-dominated transport, although it is expected that diffusive transport also plays a role. Fig. 3: Radial extent as a function of energy, shown for two H.E.S.S. analyses. Between the energy limits imposed (see main text) the observed variation with energy appears to favour advection over diffusion as the dominant transport mechanism within the nebula. With increased exposure time, the size of the nebula seems to continue to grow as H.E.S.S. becomes more sensitive and areas of weaker emission become significant. 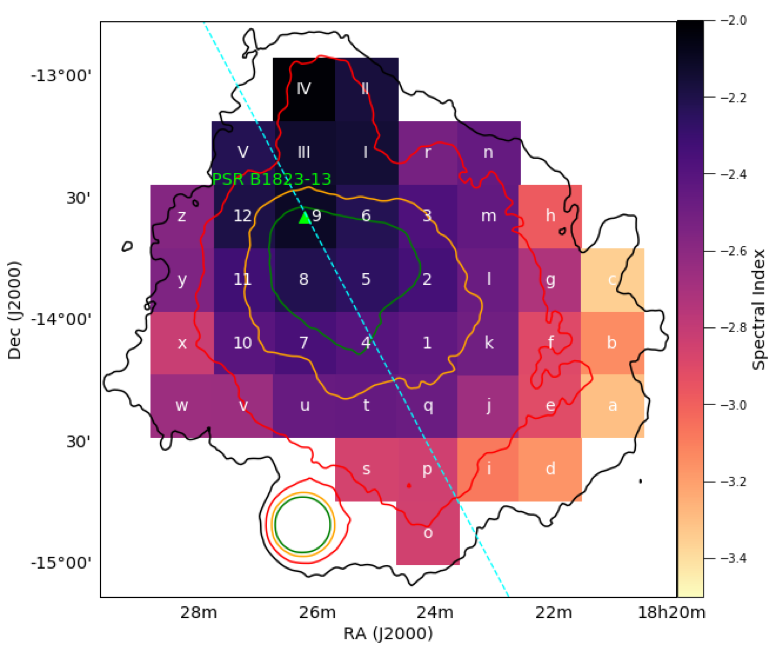 In 2006, a spatially resolved spectral analysis of the nebula used a grid of 12 boxes (labelled 1-12 in Fig. 4), each measuring 0.26° x 0.26° on the sky, was performed showing clear variation across the nebula. More than 10 years on, with over four times the previous exposure, we are able to extend this analysis with no less than an additional 26 boxes covering the nebula (roman alphabet), with an extra 5 boxes (roman numerals) covering the more recently identified neighbouring source HESS J1826-130. The resulting spectral map of the nebula is quite impressive. Fig. 4: Spectral map of the nebula, the colour scale corresponds to the best fit power law index for each region. Significance contours correspond to 5, 10, 30 and 50 sigma respectively. 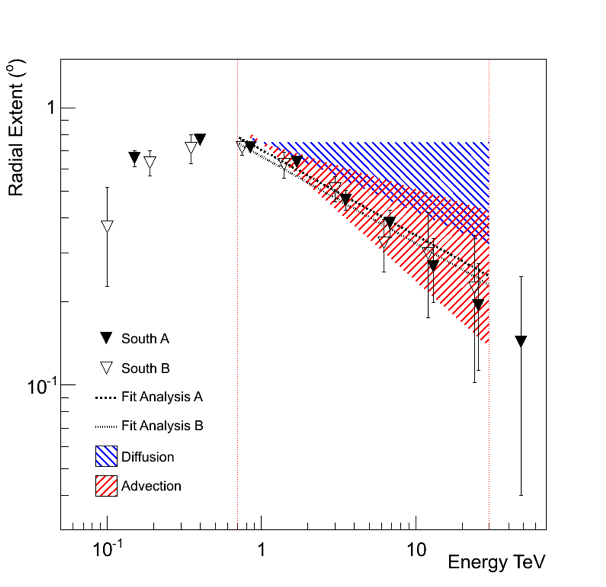 The dashed line marks the major axis of the gamma-ray emission, along which the extent was measured. Not only is the variation in spectral index (from a power law fit) distinct, becoming softer with increasing distance from the pulsar in all directions (except for towards HESS J1826-130), but the size of the nebula is truly remarkable. 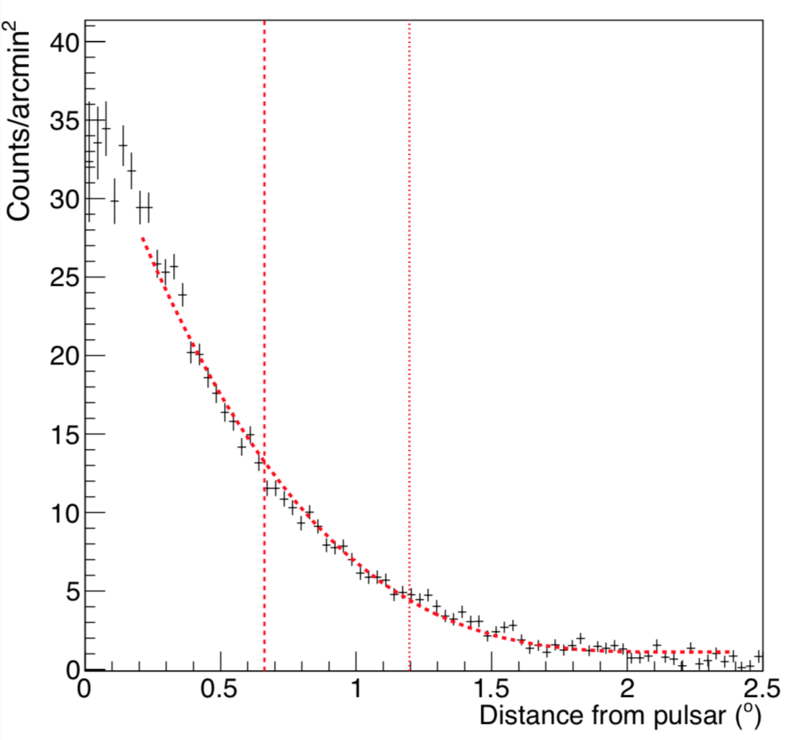 The furthermost spectral regions are located at around 100 pc (326 light-years) from the pulsar position (adopting a 4 kpc distance to the nebula) a somewhat anomalous size. Various theories have been proposed to explain this, however all require there to be something special about either the pulsar itself (such as a very short initial rotation period) or of the surrounding medium (such as very low ambient density) . Due to its fortuitous orientation relative to Earth and its age, HESS J1825-137 is an ideal cosmic laboratory for probing the inner workings of middle-aged pulsar wind nebulae.